Last night, we had ratatouille for supper. For those unfamiliar, ratatouille is essentially a medley of vegetables, cooked together and put in the pan in the right order so that they’re all tender at the same time. You can pretty much put any vegetable you want into it. In ours, we had tomatoes, green beans, onions, potatoes, and various greens. On the side, we had a handful of fresh strawberries, right on that perfect fine line between sweet and gently tart. What do all of these things have in common? They all came from our garden. A garden can be a tremendous money saver once you get into the routine of gardening. It can provide you with a bounty of food from early summer until frost comes in the late fall (and sometimes even a bit after that). Of course, a garden can also be expensive. There are startup costs, seed costs, and other costs. Here are a few tactics we’ve used over the years to make a garden very inexpensive. Share seeds Most gardens don’t need a full packet of seeds. Share them with a friend. Save seeds If you use non-hybridized seeds, like those available from Seed Savers, you can save your seeds from one year to the next, cutting down greatly on seed costs. Use water and soap as your first pesticide Mix a tablespoon of liquid soap into a spray bottle full of water and use them to attack pests you find in your garden. Make your own compost Store your vegetable scraps in a bin out by the garden. Turn the contents of the bin regularly and keep it moist. Eventually, the contents will turn into a sweet-smelling brown or black mush, which is an incredible fertilizer. Spread it on your soil before your next planting. Borrow and share tools If a friend has a small tiller or a hoe or a rake, borrow from that friend. You can often repay them with a bit of help on a project of theirs or by loaning them some of your own tools. 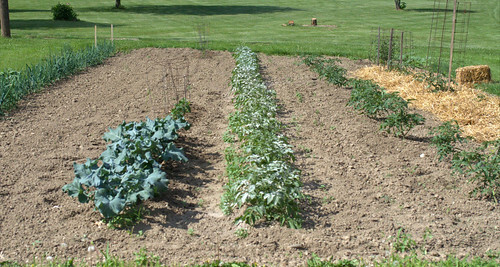 Our garden pays us for the time we put in each summer by providing us with a wonderful bounty of vegetables and fruits.